Roku 3 Review « Get Rid Of Cable | Cut The Cord And Get Rid Of Cable Today! Roku 3 Review: For decades, people have used cable or satellite subscriptions to get their favorite television and movie channels. But as cable prices continue to rise, and streaming technology continues to advance, many people have decided to get rid of cable altogether and instead use the internet to stream the content they want when they want it using streaming media services like Amazon Prime and devices like the Roku 3. Today, we are going to take a look at the Roku 3, which boasts even more features and benefits over previous models in the Roku line, as well as competitors like Apple TV and Google Chromecast. With over a thousand channels to choose from, and an excellent selection of streaming entertainment services – including Netflix, Hulu+, Amazon Prime, Redbox Instant, M-GO, Crackle the Roku 3 – is without a doubt the best streaming media device available today. The Roku 3 offers many improvements upon previous Roku models. Unlike previous models, the Roku 3 offers both WiFi and Ethernet. Roku 3 also has a faster chipset than previous models, improving wait times and loading your content much faster than before. The Roku 3 retains most of its appearance from previous models, as it is still a small, sleek device that measures approximately ninety millimeters across, with room for a small LED status control that indicates when the device is on and in use. The device features a ready-to-use HDMI output, and updates itself automatically with channels added and software updates as it stays on indefinitely. The device functions with a very easy-to-use plug and play feature. After the initial sign up process, you will be able to begin searching through the variety of channels immediately available for you enjoyment, both on the built in channel store and through the Roku website. The Roku 3 is also capable of playing a small amount of motion controlled games using the WiFi remote. A special motion sensor is set on the remote that lets you play games such as Sudoku, Galaga, and even Angry Birds. I’m personally not much of a gamer, but if you are into playing some basic games this can be a fun distraction from time to time. With the hardware improvements made to the system itself, the Roku 3 can provide users with a wide variety of different video resolutions, including high quality HD streams in 1080p. 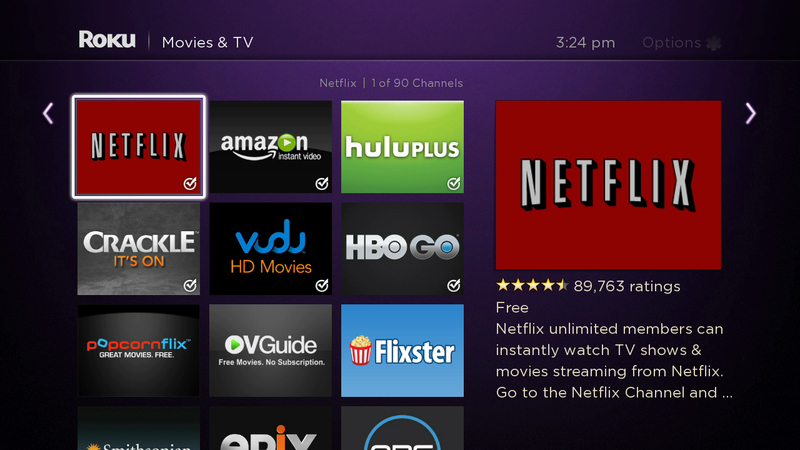 The improved processor allows for even faster menu navigation, furthermore the layout of the menus has improved dramatically from previous Roku devices; changing from a left to right scrolling format that most users did not care for to a much more usable grid format that allows users to group channels in whatever way they desire. The image performance is more than up to speed as well, and the fast broadband connection that the device offers allows for immediate, crisp enjoyment of whatever content you plan on viewing. As far as content goes, many viewers will be pleased to work with the strong selection of streaming services that can be chosen through the Roku Channel Store. All of the standard services; Netflix, Amazon Prime, Hulu+, and YouTube are there as well as specific niche interests like WWE Network and Crunchyroll . For those who would rather enjoy listening to music, audio apps such as Tunein, VEVO, and Amazon Prime Music are available. Roku 3 also provides access to an untold amount of private channels that aren’t listed in the main channel store. If you do some digging, you can find some really unique content out there. For a more private listening experience, the remote control features a headphone jack and includes a pair of headphones, so if you are a night owl and want to watch some television after your spouse goes to bed, you can do so without disturbing them. A Roku app can also be downloaded for iOS and Android devices, which provide users with basic menu controls and channel scrolling. Another cool feature of the Roku 3 is that instead of infra-red, or bluetooth, the remote control connects to the unit via WiFi. The advantage to this is that you don’t have to aim the remote at the unit, allowing you to mount the device wherever you want and even control it from another room if you are in the mood to prank someone! While those are all great features, the feature that really sets this Roku 3 review apart from every other streaming media player on the market is the built-in search feature. The search feature allows you to enter in whatever content you are looking for by name, genre, actor etc… and find every option available on every channel you have installed. This allows you to not only find the specific content you are looking for, but also gives you an idea of what the best option to watch would be. For instance, I recently wanted to watch the show Veronica Mars. Using the Roku 3 search function, I was able to find that it was available on a couple of different channels but only Amazon Prime had it available without additional charge, so I watched it there and saved a few dollars. This feature alone makes Roku 3 better than any other media streaming option available. There really aren’t many flaws with the Roku 3 review, it will serve most people’s streaming media needs excellently. The one thing that the Roku 3 doesn’t handle very well is playing media from your personal library. While they do have the Plex media server app available, I have never found it to work very well or have a very easy interface when compared to how Apple TV integrates with iTunes. If you are looking to play a lot of your own downloaded content, this may not be the device for you. The only other minor issue with the Roku 3 is that, in my experience, the remote control goes through batteries very quickly. I have found this can be partially prevented by laying the remote flat when not in use, because the motion controls necessary for the games are always active and if it isn’t lying flat, it will eat the batteries pretty quickly. Roku 3 is without a doubt the best media streamer available on the market today. As more of us decide to cut the cord and get rid of cable, it will be important to have a device like the Roku 3 review that has all of the best streaming media services in one place. Playing your own downloaded content is a small sacrifice to make in exchange for all that the Roku 3 review has to offer (and if anyone knows of any media server apps that function better than Plex please drop me a line) and at a price point of $50 – $99 it will pay itself off in about a month when you decide to get rid of cable.